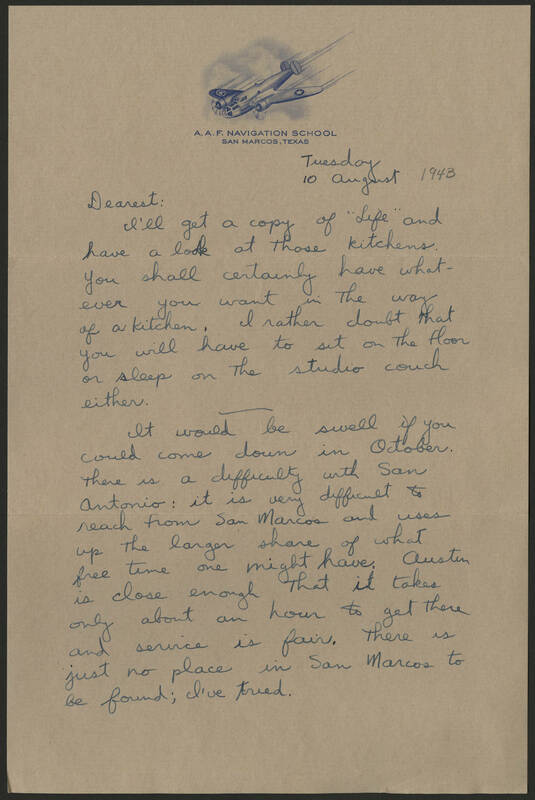 Tuesday 10 August 1943 Dearest: I'll get a copy of "Life" and have a look at those kitchens. You shall certainly have whatever you want in the way of a kitchen. I rather doubt that you will have to sit on the floor or sleep on the studio couch either. It would be swell if you could come down in October. There is a difficulty with San Antonio: it is very difficult to reach from San Marcos and uses up the larger share of what free time one might have. Austin is close enough that it takes only about an hour to get there and service is fair. There is just no place in San Marcos to be found; I've tried.